Espoo, Finland - Nokia will hold a 360° Livestream event to announce a major innovation and share the company's vision and strategy on the evolution of IP networking. 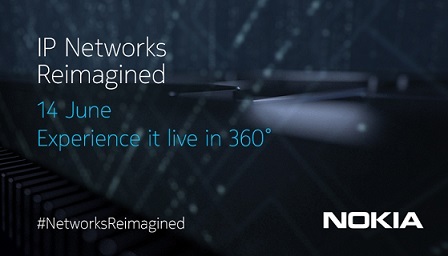 The "IP Networks Reimagined" live event runs Wednesday, June 14 from 9:00 - 11:00 am Pacific Time (PT) and will include presentations by Nokia senior leaders and customers, as well as an executive panel. Viewers can register for the event here, and use this link to calculate local time zones. Journalists can send questions to sarah.miller@nokia.com, or kstone@hoffman.com. Industry analysts can contact renee.domanic@nokia.com, and financial analysts should direct inquiries to thomas.bevilacqua@nokia.com.